Louis Dodds' sixth goal of the season saw Port Vale through to round two of the FA Cup at the expense of Blue Square Premier high-fliers Stevenage. Stevenage captain Mark Roberts' poor backpass played in Dodds, who scored with his head after his initial effort was saved by home keeper Chris Day. 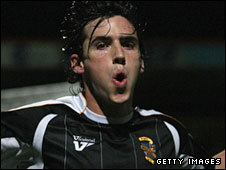 Stevenage's Mitchell Cole was later denied an equaliser by the post after his shot beat Vale keeper Chris Martin. The defeat is Stevenage's first home loss in almost a year. Vale will host free-scoring League One side Huddersfield in round two. "We feel that over the two games we should have come out on top. We haven't and we are dissecting it in there and trying to work out what the difference was. "Robbo (Mark Roberts) is beating himself up over his mistake for the goal, but to be honest we should all be holding our hands up." 90:00+4:05 The game is over, as the referee blows his whistle. 90:00+2:42 Corner taken short by Louis Dodds. 90:00+2:08 David Howland has an effort at goal from outside the area missing to the wide right of the goal. 90:00+1:59 Free kick awarded for an unfair challenge on John McCombe by Charlie Griffin. Direct free kick taken by John McCombe. 90:00+0:31 Free kick taken by Kris Taylor. 90:00+0:31 Substitution Danny Glover on for Lewis Haldane. 90:00+0:31 Free kick awarded for an unfair challenge on Lewis Haldane by Ronnie Henry. 89:53 Unfair challenge on Andrew Drury by Marc Richards results in a free kick. Chris Day restarts play with the free kick. 88:16 Free kick awarded for an unfair challenge on Doug Loft by Peter Vincenti. Free kick taken by Kris Taylor. 87:30 John McCombe fouled by Charlie Griffin, the ref awards a free kick. Free kick taken by John McCombe. 86:32 Shot from just outside the box by Darren Murphy misses to the left of the target. 85:30 Peter Vincenti fouled by Louis Dodds, the ref awards a free kick. Ronnie Henry delivers the ball from the free kick right-footed from left channel. 84:32 Substitution Scott Laird leaves the field to be replaced by Joel Byrom. 84:04 Unfair challenge on Andrew Drury by David Howland results in a free kick. Free kick crossed right-footed by Andrew Drury from left wing. 83:26 Shot from deep inside the area by Robert Taylor goes over the bar. 82:23 Anthony Griffith gives away a free kick for an unfair challenge on Mitchell Cole. The free kick is delivered right-footed by Andrew Drury from left wing, Anthony Griffith makes a clearance. 81:40 Charlie Griffin challenges Doug Loft unfairly and gives away a free kick. Free kick taken by Chris Martin. 80:19 The referee gives a free kick against Lewis Haldane for handball. Chris Day restarts play with the free kick. 79:27 Substitution Peter Vincenti comes on in place of David Bridges. 78:25 Corner taken by Kris Taylor from the left by-line played to the near post, clearance made by Andrew Drury. 78:13 The ball is swung over by David Howland, clearance by Mark Roberts. 76:48 Outswinging corner taken by Kris Taylor from the left by-line played to the near post, Ronnie Henry manages to make a clearance. 76:27 Corner taken by Kris Taylor from the left by-line to the near post, Ronnie Henry manages to make a clearance. 75:34 Ronnie Henry manages to make a clearance. 75:34 Substitution Jason Jarrett goes off and David Howland comes on. 74:12 Free kick awarded for a foul by Ronnie Henry on Marc Richards. Kris Taylor crosses the ball from the free kick left-footed from left wing, Michael Bostwick manages to make a clearance. 72:45 Corner from the right by-line taken by Andrew Drury, clearance made by Anthony Griffith. 68:17 Outswinging corner taken by Andrew Drury, Chris Martin makes a save. 66:15 Free kick crossed right-footed by Andrew Drury. 66:15 Booking Caution for Kris Taylor. 66:06 Free kick awarded for a foul by Kris Taylor on Yemi Odubade. 65:25 The offside flag is raised against Charlie Griffin. Indirect free kick taken by Lee Collins. 64:10 Free kick taken by Chris Martin. 64:10 Booking Yemi Odubade booked for unsporting behaviour. 63:39 Yemi Odubade gives away a free kick for an unfair challenge on John McCombe. 62:24 Inswinging corner taken right-footed by Andrew Drury, clearance made by Anthony Griffith. 62:10 Ronnie Henry crosses the ball, clearance by Lee Collins. 59:13 Outswinging corner taken by Andrew Drury from the right by-line. 58:45 Marc Richards is penalised for handball and concedes a free kick. Ronnie Henry delivers the ball from the free kick right-footed from right channel. 57:57 Andrew Drury takes a shot. Clearance by John McCombe. 56:25 Corner taken right-footed by Andrew Drury from the left by-line, clearance by Anthony Griffith. 54:34 Effort on goal by Jason Jarrett from just inside the area clears the bar. 54:00 Kris Taylor takes a inswinging corner to the near post. 53:11 Outswinging corner taken from the right by-line by Andrew Drury, Mark Roberts takes a shot. Save made by Chris Martin. 52:52 Mitchell Cole produces a left-footed shot from deep inside the penalty area and strikes the post. 52:31 Charlie Griffin is flagged offside by the assistant referee. Free kick taken by Chris Martin. 51:03 Effort from inside the area by Charlie Griffin misses to the left of the goal. 50:38 The offside flag is raised against Lewis Haldane. Indirect free kick taken by Chris Day. 50:11 Free kick awarded for a foul by David Bridges on Anthony Griffith. Direct free kick taken by Anthony Griffith. 48:35 Inswinging corner taken left-footed by Kris Taylor, clearance by Mark Roberts. 47:07 Foul by Robert Taylor on Yemi Odubade, free kick awarded. Ronnie Henry takes the free kick. 45:01 Substitution (Stevenage) makes a substitution, with Darren Murphy coming on for Jon Ashton. 45:00+1:04 The first half comes to an end. 45:00+0:10 Louis Dodds takes a shot. Jon Ashton gets a block in. 44:02 Charlie Griffin produces a header from close range which goes wide of the left-hand upright. 43:07 Marc Richards produces a right-footed shot from just outside the box that goes wide left of the target. 41:10 Jason Jarrett gives away a free kick for an unfair challenge on Michael Bostwick. Andrew Drury delivers the ball, Jon Ashton produces a header from inside the area that goes over the crossbar. 40:08 Corner taken left-footed by Kris Taylor, Chris Day makes a save. 38:12 Kris Taylor challenges Charlie Griffin unfairly and gives away a free kick. Free kick crossed right-footed by Ronnie Henry from right wing. 37:13 Effort on goal by Jason Jarrett from just outside the area goes harmlessly over the target. 35:28 Mitchell Cole crosses the ball, clearance made by Lee Collins. 32:08 Foul by Charlie Griffin on Anthony Griffith, free kick awarded. Chris Martin takes the free kick. 27:55 Free kick awarded for an unfair challenge on Charlie Griffin by Lee Collins. Andrew Drury crosses the ball from the free kick right-footed from left wing. 27:43 The referee blows for offside against Marc Richards. Chris Day takes the free kick. 26:27 Shot from just outside the penalty box by Marc Richards misses to the left of the target. 26:03 Corner taken left-footed by Kris Taylor from the right by-line to the near post, clearance made by Ronnie Henry. 25:27 Mark Roberts is penalised for handball and concedes a free kick. Free kick taken by Chris Martin. 25:03 Lewis Haldane concedes a free kick for a foul on Ronnie Henry. Jon Ashton takes the free kick. 23:16 GOAL - Louis Dodds:Stevenage 0 - 1 Port Vale Louis Dodds grabs a headed goal from inside the area. Stevenage 0-1 Port Vale. 22:16 The referee blows for offside. Chris Day restarts play with the free kick. 20:55 Scott Laird concedes a free kick for a foul on Doug Loft. John McCombe delivers the ball from the free kick right-footed from right wing, Ronnie Henry manages to make a clearance. 15:48 Unfair challenge on Ronnie Henry by Robert Taylor results in a free kick. Free kick taken by Chris Day. 14:00 Charlie Griffin produces a right-footed shot from deep inside the penalty box which goes wide of the left-hand post. 13:10 Shot by Lewis Haldane from deep inside the penalty area misses to the left of the goal. 9:45 The offside flag is raised against Charlie Griffin. Chris Martin takes the free kick. 7:24 Handball decision goes against Michael Bostwick. Free kick taken by Chris Martin. 5:32 Mark Roberts is ruled offside. Indirect free kick taken by Chris Martin. 4:54 Doug Loft gives away a free kick for an unfair challenge on Scott Laird. Free kick crossed right-footed by Ronnie Henry, John McCombe makes a clearance. 2:52 Inswinging corner taken right-footed by Michael Bostwick, Mark Roberts has a headed effort at goal from deep inside the area missing to the right of the goal. Correction - 2:32 Yemi Odubade takes a shot. Save made by Chris Martin. 2:32 Yemi Odubade takes a shot. Save by Chris Martin. 1:38 Scott Laird challenges Doug Loft unfairly and gives away a free kick. Anthony Griffith crosses the ball from the free kick right-footed from right wing, clearance made by Michael Bostwick.